The objectivity that characterises Bernd and Hilla Becher’s recording of industrial architecture resulted in pictures that allow examination of the structures in almost forensic detail and their typological approach to display allows comparisons between buildings of the same type. The precision that comes from using a large format camera and the neutral lighting of an overcast sky makes for an extraordinary level of detail. There is a sense of completeness that comes from seeing multiple structures of each type. 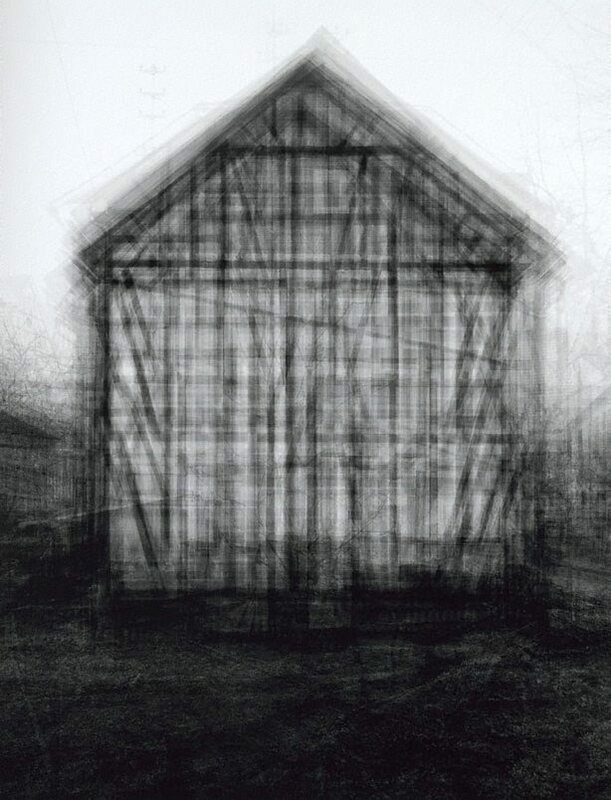 Idris Khan has taken the Bechers’ work as a starting point for a different examination of the same territory. Rather than building up a picture of the whole from the precise detail of each individual image, Khan has taken an average. 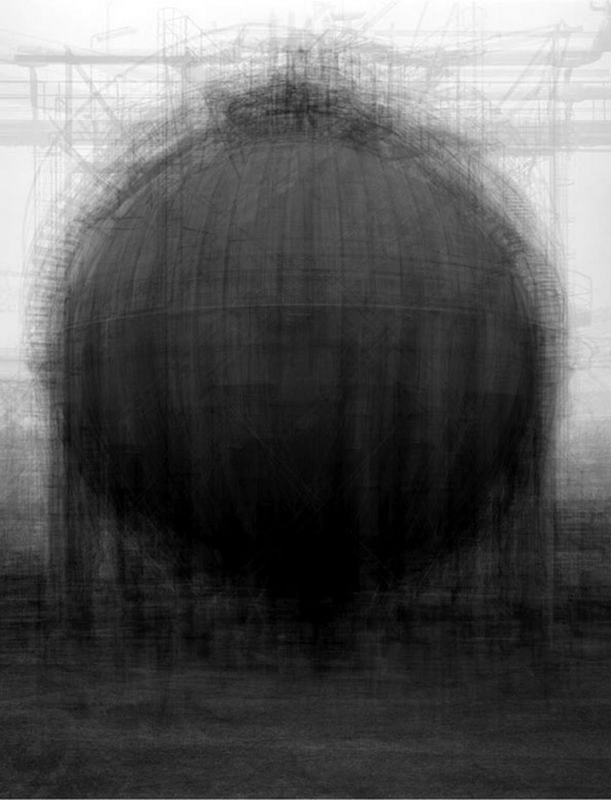 By overlaying all the Bechers’ images of a particular type of structure – for instance spherical type gasholders – Khan has produced sketchy pictures that seem to suggest an approximate version of how each type of building might be expected to look. With the uncertain edges that results from overlaying pictures of broadly similar variants, Khan’s pictures look almost like drawings. By gathering as much information as possible about each subject and combining it to into a single whole picture, Khan is making pictures that feel far from objective. There is a sense of speculation,a notion that perhaps a prison type gasholder might look something like this. But Khan has achieved this apparent imprecision by simply re-presenting the comprehensive gathering of data achieved by Bernd and Hilla Becher. Khan’s pictures, printed on a much larger scale than those of Bernd and Hilla Becher, are fascinating in a very different way. They are beautiful approximations of extraordinary structures and their appeal lies in their imprecision. Turning his attention to painting but taking the same completist approach, Khan transforms the precise accuracy of Caravaggio’s paintings and transforms them through layering into images that retain the visual connection with painting but the realism gives way to a more impressionistic approach; the image is hard to read but there are shadowy figures in places and what seems to be a jumble of limbs. There is a darkness here that seems fitting given that these are the paintings made by Caravaggio after he left Rome rather than face justice for killing a man in an argument. 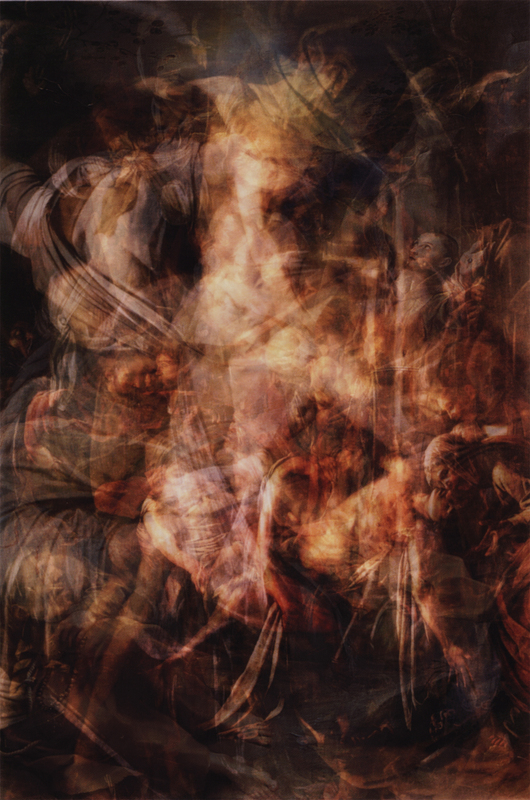 Whereas Khan’s reworking of the Bechers’ pictures seems to turn detailed black and white photographs into sketchy drawings, his layering of paintings yield photographs with a painterly feel. For me, one of the most unexpectedly pleasing of Khan’s works is in a way the one with the most predictable outcome. The result of averaging all the Turner postcards on sale at Tate Britain is an image that looks, well, a lot like a Turner painting. 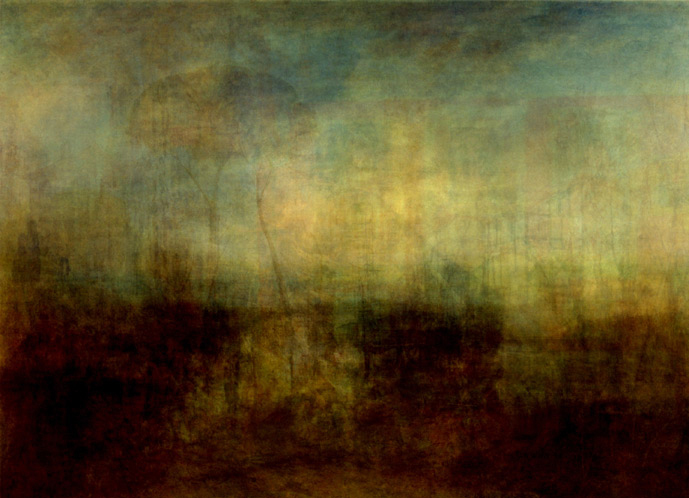 It’s partly the colour and light but Khan’s photograph also highlights Turner’s expressive use of paint. As well as exploring aspects of art history through his work, Khan has applied the same approach to other areas of culture including some of the texts that have strongly influenced many contemporary artists such as Sigmund Freud’s essay on the uncanny. 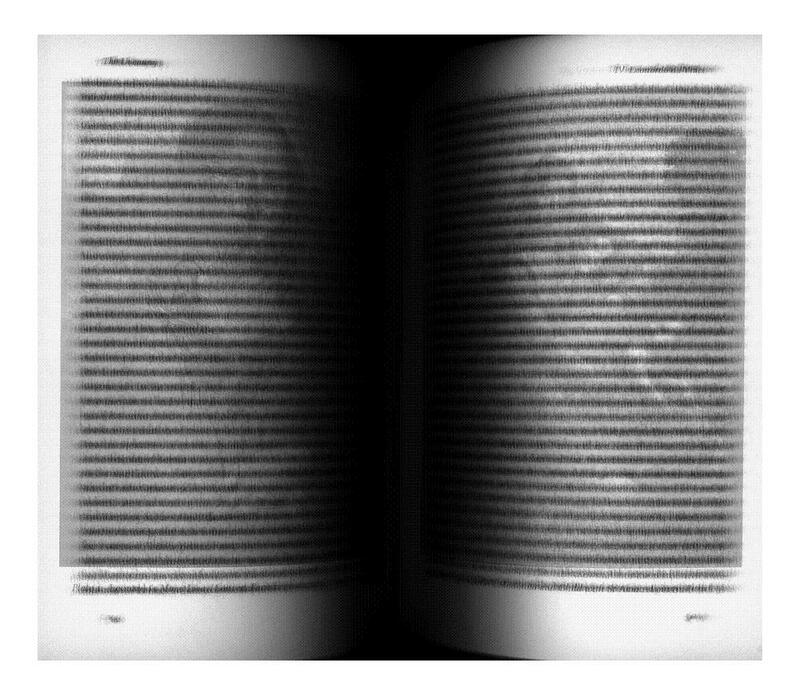 The text becomes an unreadable jumble butthe Mona Lisa peers out at us from beneath it making the connection between art and the theory that so often underpins it. While artists often engage explicitly with ideas of the uncanny, there are also many artworks in which strange familiarity seems to have wormed its way in unintended. And of course, there is a sense of the uncanny about Khan’s own work. This entry was posted in Painting, Photography, Theory and tagged architecture, art, Bernd and Hilla Becher, Caravaggio, Idris Khan, photography, Sigmund Freud, Turner, Uncanny by Ann Jones. Bookmark the permalink. Great post, Ann. I’ve never seen his work either. 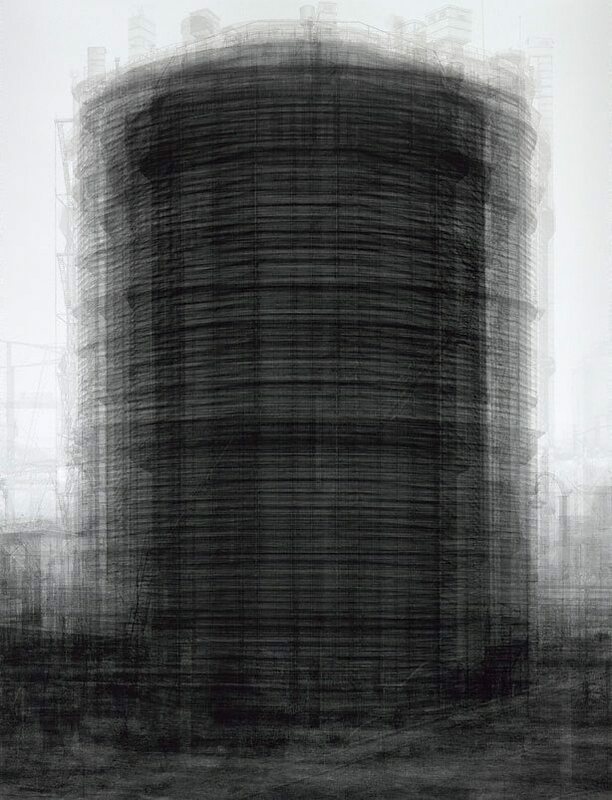 Love the sense of immanence in the Becher works – like something’s about to break through the surface and resolve itself. The (Warner Bros.) Tasmanian Devil of the art world.